This entry for Regional Recipes is a tad late, but I think we deserve an A for effort seeing as I am currently writing the copy (text) for this post on board an airplane! I would have to consolidate photos and text at a later time. Oh, this is not an airplane. It's actually an "airbus", and I must say, I didn't realize thay can make a plane this small. It's unbelievably small -- or tight, I should say -- even for a short person such as myself! We had originally thought that we would miss this edition of Regional Recipes, but after some last-minute photo processing on my part (after weeks of being too busy to do any), I discovered that we did make something Chinese after all! In fact, if we weren't so tardy, we can actually submit three Chinese dishes. My father mentioned a craving for lobsters and I am only too happy to oblige. Not knowing how to choose live lobsters (or crabs, for that matter), I asked the seafood counter man at the supermarket to choose me three good lobsters. They weren't on sale at that point and I probably paid $8.99 or something like that per pound, but that is better than paying $16 or 19 per pound if we chose to have lobsters at a restaurant. The only problem was that we couldn't or wouldn't be able to cook the lobsters any other way but for boiling them straight up. 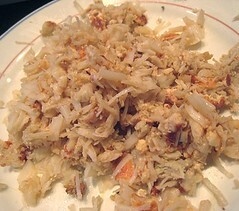 We couldn't stir-fry the lobsters with green onions and ginger, for example, because we had no way of breaking them into pieces before they were cooked. In the end, though, everything ends well, I suppose, because my father wanted lobsters cooked that simply. That's the B there, of Hong Ba (Red-Braised Pork Hock) fame, chopping up the lobster pieces. Thanks, the B! Nope, these aren't lobsters. 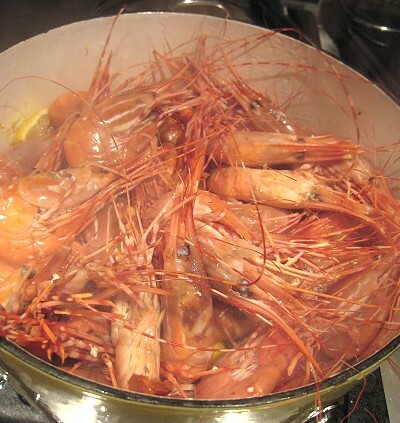 These are prawns! 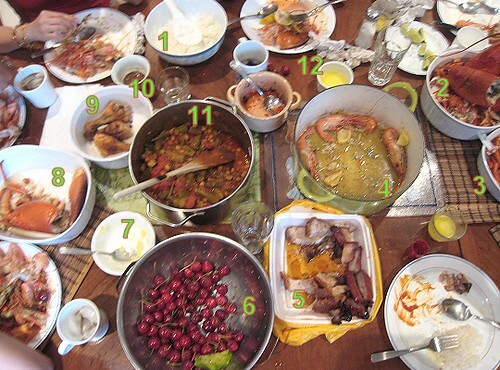 The next photo is not for the faint of heart, as the table looks a tad busy. But, there it is, our feast. We had lobster, prawns, pork, chicken, vegetables and fruits! 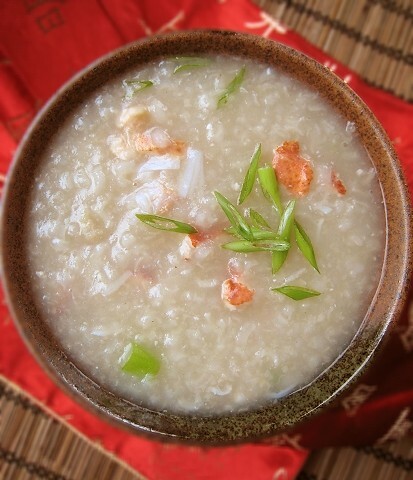 We had actually thought of making lobster congee while we were still in the midst of our feast. 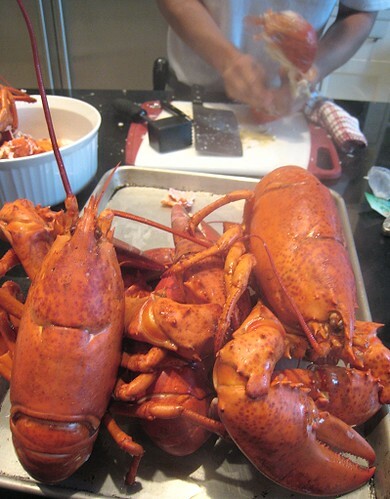 In fact, everybody at the table was already mentioning how good lobster congee is going to be. 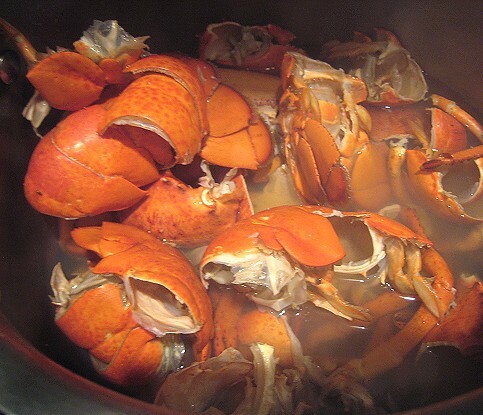 The next day, I placed the lobster shells in a pot with water to make stock. 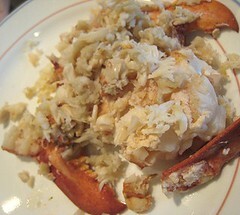 Then, I painstakingly removed any remaining flesh from the lobster remnants. 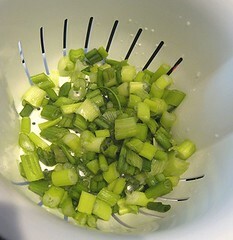 We prepped some green onions for later. To start the congee, we simply sautéed some ginger pieces in some sesame oil, then added our rice, then the lobster stock. 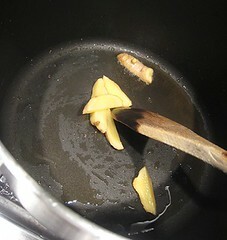 We let the mixture come to a boil, then simmered the pot until the rice was cooked. 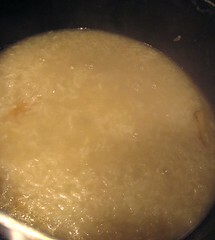 We were a little off in our rice:liquid ratio, so we ended up adding more water near the end. We seasoned with a little salt and the littlest amount of soy sauce. The lobster meat went in, then green onions. Oh, it's a strictly add-your-own-tomalley kind of affair, as not everybody is into tomalley. 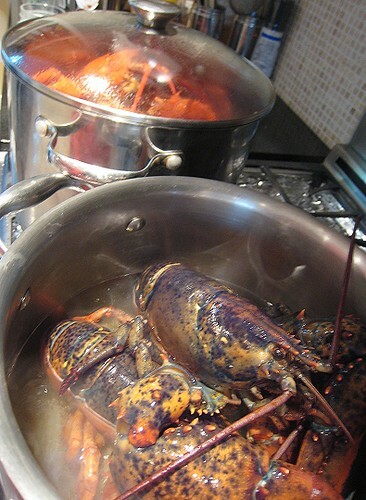 I daresay, when TS was making the lobster broth, I found the smell more intoxicating than the lobsters themselves. 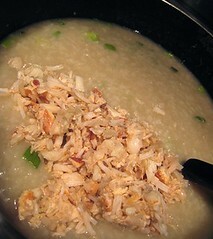 To everybody's satisfaction, the resulting lobster congee was quite delicious. It had such depth of flavour and yet it was light at the same time. 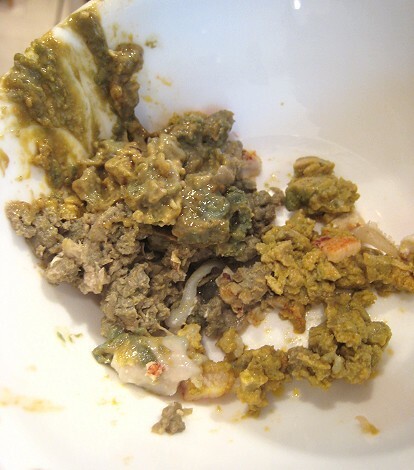 You'd think that the end-all and be-all of lobster is going to be succulent lobster meat dripping with the sauce or condiment of your choice. 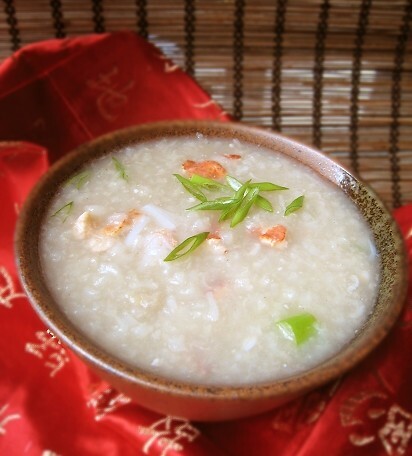 Of course, succulent lobster meat is something quite amazing in itself too -- but given this congee, I daresay the broth is where it's at -- this is the essence of lobsters. The region for this edition is China. The round-up will be hosted at Blazing Hot Wok and will be posted around/after August 20. That is one heavenly sounding dish, so comforting yet so rich! What a wonderful and lux dish! Oh gosh, i just want to jump on that table. What a feast! 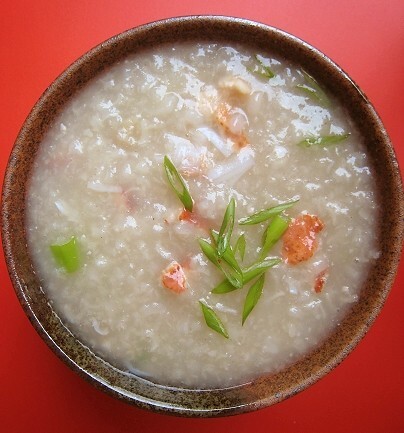 And the lobster congee is brilliant, i can 'almost' perfectly imagine the taste. Now if only you could help my imagination and deliver me some! What a feast! I've always wanted to try cooking lobsters! 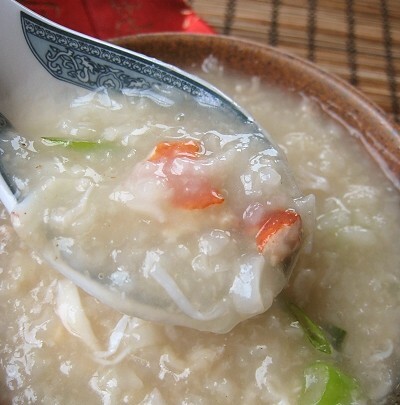 Haha... We would be ineterested to see *your* twist on lobster congee!